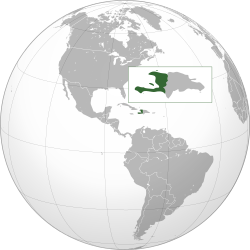 Haiti (pronounced /ˈheɪti/ (deprecatit template); French Haïti, pronounced [a.iti]; Haitian Creole: Ayiti, Haitian Creole pronunciation: [ajiti]), offeecially the Republic o Haiti (République d'Haïti ; Repiblik Ayiti) is a Caribbean kintra. It occupies the wastren, smawer portion o the island o Hispaniola, in the Greater Antillean archipelago, which it shares wi the Dominican Republic. Ayiti (land o heich muntains) wis the indigenous Taíno or Amerindian name for the muntainous wastren side o the island. The kintra's heichest point is Pic la Selle, at 2,680 metres (8,793 ft). The total aurie o Haiti is 27,750 square kilometres (10,714 sq mi) an its caipital is Port-au-Prince. French an Haitian Creole are the offeecial leids. ↑ "Article 4 of the Constitution". Haiti-reference.com. Retrieved 24 July 2013. ↑ "Haiti". The World Factbook. Central Intelligence Agency. ↑ 4.0 4.1 4.2 4.3 "Haiti". International Monetary Fund. ↑ "Gini Index". The World Bank. Retrieved 21 November 2015. Wikimedia Commons haes media relatit tae Haiti. This page wis last eeditit on 2 September 2017, at 03:50.